2 thread chain-stitch keyhole buttonhole machine with adjustable hole length cut after open ended button hole with eye or no-eye selector. Dual mode cut before or cut after key hole machine. Selectable dual mode cut before or cut after key hole machine. 2 thread chain-stitch keyhole buttonhole machine with adjustable hole length, selectable cut before or cut after button hole and adjustable tail length. Reconditioned or Rebuilt to order by our Ex-Reece expert technicians. 230V, 50z single phase, (Standard 13amp plug). Button hole heavy duty, cut after knife, adjust fly bar with eye/no eye function. Rebuilt or Reconditioned to order by Reece trained experts. 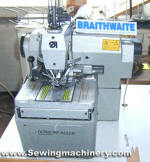 Cord trim machine for jeans or work wear etc. 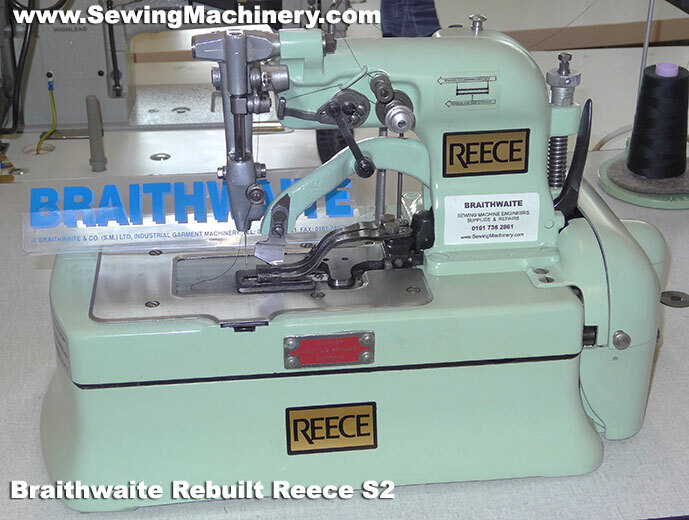 Reece S3 high speed button hole sewing machine. With matching Reece unit stand. Supplied serviced and tested by Reece Expert including 3 months RTB used machine warranty. Rebuilt Reece S2 high speed, chainstitch button hole. Stripped to component level, then rebuilt using new parts where necessary and repainted by our Reece Expert. High speed label sewer, enlarged plate, up-to 2"